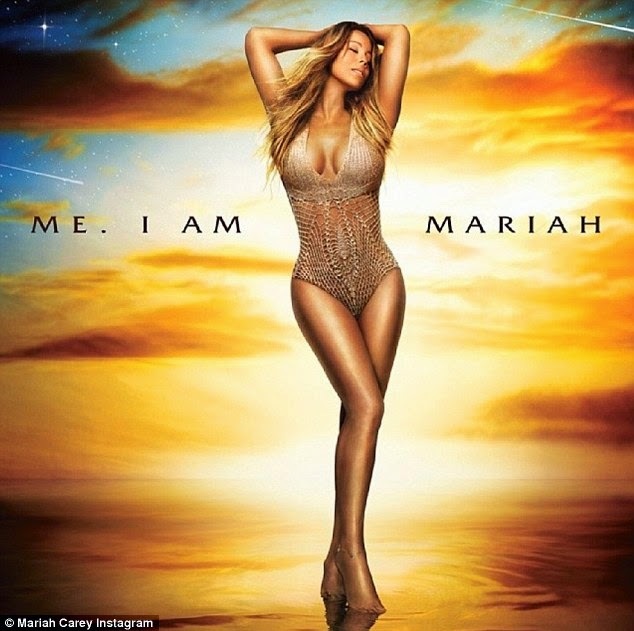 She refers to herself as 'The Elusive Chanteuse' in the title of her upcoming 14th studio album, which is set to drop on May 27, but really, who is Mariah Carey kidding? While promoting her first release in four years in New York's Times Square on Thursday, the 44-year-old was as accessible as they come as she mugged for the cameras, posing in a number of over-the-top, cringeworthy positions as she was swarmed by her adoring public. The original diva was in fine form, dressed to thrill for the event in a black fit and flare gown that hugged her curves in all the right places and featured a plunging neckline that revealed plenty of her ample cleavage. She was also rocking the black leather fingerless elbow-length glove that she's been sporting on her right arm ever since the sling came off after she dislocated her shoulder in July last year while filming the video for the remix of #Beautiful. On her left wrist, she donned a sparkling platinum and diamond bracelet, while a pretty matching butterfly ring - which paid homage to her 1997 album of the same name - replaced her wedding bling. Her long golden tresses were worn down in messy waves and she sported her signature perennial sunkissed glow, with her face made up to match, her dark brown eyes accentuated with lashings of mascara and golden shimmery shadow, her lips painted a glossy rose colour to match her cheeks. The diva literally shut down Times Square during her appearance, the streets impossible to navigate thanks to the masses of fans who packed every inch of the famous strip. Billboards all through the mall featured the star's album cover, which sees the leggy beauty bathed in a golden glow as she stands tall in just a gold crocheted swimsuit, her hands resting behind her head as she turns her face to the side, her eyes gently closed in a moment of absolute bliss. Mariah actually looked somewhat surprised and shocked at the turnout of fans, and she made sure she rewarded them for their patience and support by giving them the show of their lives. Ever the demure, shy and retiring type, she pulled the modelling 101 one arm behind the head, the other on the hip pose as she somewhat mimicked her cover shot. Taking to Instagram, she later shared several videos of fans greeting her with handmade signs that read 'U R So Hot Mimi' and 'Obsessed With Mariah' among others. While her album title may have left many scratching their heads, the star has undoubtedly had some rather weird and wonderful titles in the past - think The Emancipation Of Mimi and Charmbracelet - so Me. I Am Mariah... The Elusive Chanteuse is hardly all that shocking. The star has shared the meaning behind the title with fans in a video posted to social media, explaining that the back cover features the only self portrait she's even drawn, at the age of three and a half, which features the scribbled words Me. I am Mariah.